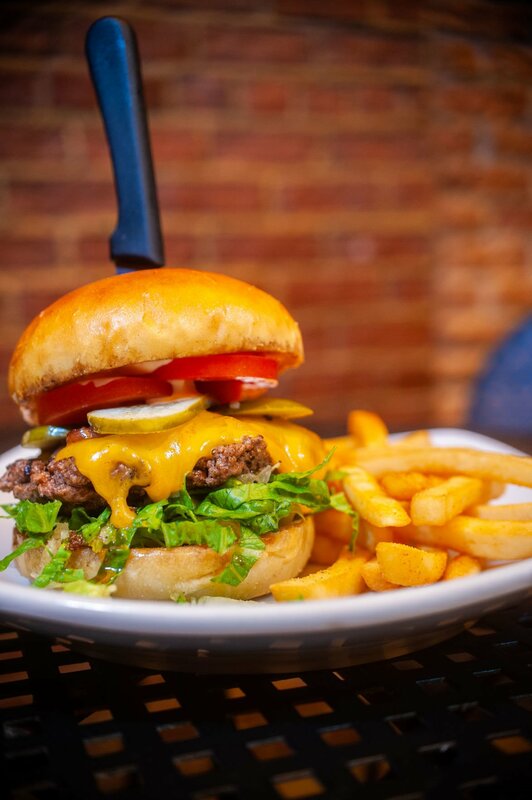 The Angelo burger is a classic cheeseburger with lettuce, tomato, onions, pickles and mayonnaise. 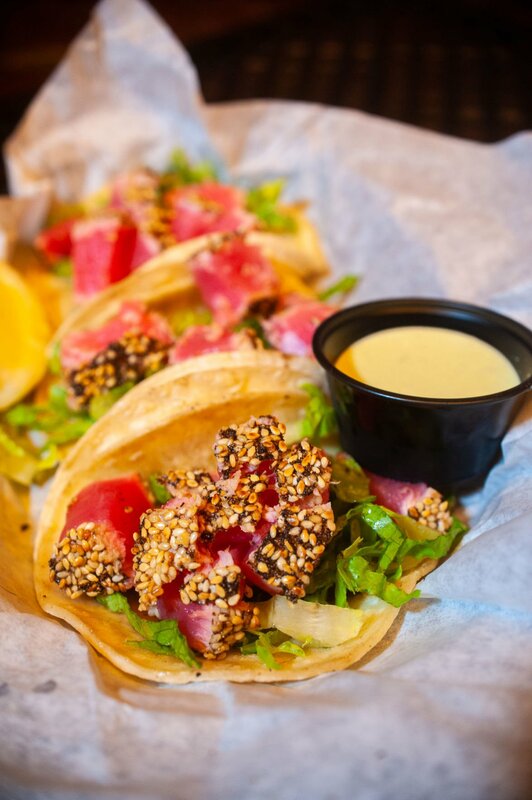 Almost sushi tacos consists of lightly seared ahi tuna rolled in black peppercorns and sesame seeds on a bed of lettuce and served with a wasabi red pepper honey sauce. Beer-battered mushrooms with chipotle mayo. The sport dog is Muertos’ take on the Chicago dog, featuring vienna beef frankfurters, sport peppers, sweet relish, onions, tomato, pickles, ketchup and mustard on a Milano roll. The serrano dog features grilled serrano peppers and onions, chopped bacon, jack cheese and tomatillo salsa. Many of us are raised with two basic rules: Don’t talk to strangers and don’t go down dark alleys. So when I heard about a restaurant that I had to try that was down a dark alley in downtown Bakersfield, I had to break some rules. I was pleasantly surprised upon arriving to Wall Street alley. This wasn’t a traditional alley filled trash bags, stray animals and questionable faces. This alley had friendly walls filled with mural street art, wrought-iron gates and is even lined with potted trees. 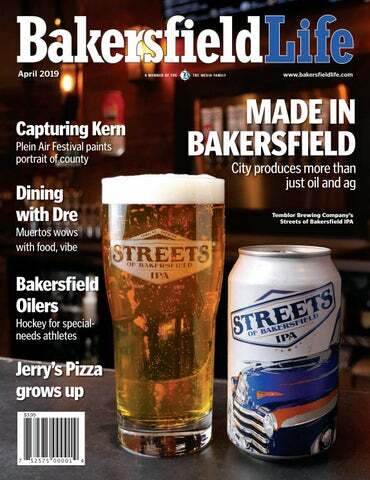 On the north end of the alley was Muertos Kitchen & Lounge nestled inside a breathtaking brick building that was once Bakersfield’s firehouse and stable. Once I walked through the door, I was immediately greeted and seated by none other than the restaurant owner herself, Shawna Haddad Byers. Once I was seated, I took a look around and saw that the walls inside of Muertos were just as vibrant as the street art just outside. Family photos, awards, music memorabilia and electric guitars were just a few of the items that decorated the brick walls. The menu is short and to the point, with a variety of apps, salads, burgers, tacos and dogs. It sounds simple but is definitely not for the weary. I saw flavorful, large portions and three hours at the gym in my future. I tried the Angelo burger, sport dog, serrano dog, beer-battered mushrooms and the almost sushi tacos. All the dishes passed my visual presentation test. All the ingredients were vibrant and colorful, which also showed the freshness of the preparation. However, there were two items that just fell short flavorwise. The beer-battered mushrooms were perfectly fried and the perfect consistency, but I would have loved to taste more of the beer from the batter. I would suggest a beer with more hops or darker ale beer to remedy this as well as a touch more salt. The almost sushi tacos looked beautiful with the ahi nicely crusted and seared pink. However, they fell flat for me due to a lack of seasoning and citrus to make a vibrant bite. A dash of salt and fresh herbs would do these tacos justice. On the bright side, the hots dogs were a grand slam. These all-beef dogs were large and topped with a mountain of aromatic ingredients that had me salivating and reaching for my fork and knife. With chilis, onions, mustard and peppers topping these dogs, an ice-cold beer is a must. Lastly came the Angelo burger. Looking at the menu, the Angelo seemed like a straightforward all-American burger. Toppings consisted of cheddar cheese, pickles, grilled onions, tomatoes and spread. Nothing out of the ordinary, right? The Angelo burger was probably the best burger I’ve had in all of Bakersfield – if not ever. The burger was juicy, flavorful and perfectly seasoned. The star of the burger was the thick all-beef patty and the toasted sweet brioche bun. The toppings were minimal, which was a perfect complement. Yes, YES and YAASS! I was a little hesitant at first to try a restaurant that was down an alley but I’m glad I did. Muertos has a colorful history that is timeless and cuisine that is delicious. Its modern American menu takes the cake with all your favorites that are just a cut above the rest.